Last week, my brother, Les came by for a visit. He spent over 30 years as a telephone linesman in Indiana. Basically, he spent a lot of time up in the air working! Most times it was 80 feet or more in the air. My wife Barb asked him if he ever was scared of heights at some point, and if so, how he overcame that fear. Les’ answer was fascinating. Les focused solely on the work right in front of his eyes. He didn’t allow the fact that he was 80-100 feet i the air distract him. This is an excellent lesson for us in business. Too often, it’s easy to let things “on the ground” distract us away from being focused and disciplined of what’s in front of us. How many times has an e-mail popped in and distracted you away from your work? How about a phone call? I regularly hear from people who I call that ask if they can call back because they are in a meeting. Why answer the phone? Being focused on your current task and then moving on to the next takes real discipline. The people who can commit to doing this will find they get more done and end up with more free time than those that don’t. My best wishes for all for a wonderful Thanksgiving. I hope you have a warm, safe, and well-fed day with your family and friends. I lost my keys after basketball practice (I volunteer for the local high school team). I found myself standing in the snow waiting to get them delivered from the person whose car I had dropped them in while waiting for the gym to open. This little fiasco put me about 45 minutes behind in my day. It seemed like everything I attempted to do or complete had something pop up that threw it for a loop. My 85-year old dad who is struggling with cancer got an infection on his leg. We needed to take him down to the doctor to have it checked and get an antibiotic. It was lightly snowing, but not sticking. By the time we got out of the doctor’s office and had the prescription filled, it was an all-out blizzard. Cars on the highway were backed up and couldn’t get up either of the hills to my parents house. Barb (my wife) and I decided it would be best to stop at the local Dairy Queen to stay warm, use the facilities, and eat while the mess cleared up. The mess didn’t clear up. After hauling my parents into the DQ, after eating we hauled them out of the DQ (no small effort), loaded them into my dad’s car which I was driving and gave it a try. As we started up the hill, I saw a line of cars just like the ones I was driving on the side of the road. They had made the attempt up the hill without success. I pulled over into a local business parking lot and called my friend and client who has a truck to see if he could help us. He was still in town luckily and braved the traffic and storm to get us. We hauled my parents out of the car in what was amounting to a blizzard, loaded them up and into Kevin’s truck, and he plowed up the hill to their home and we deposited them there. Kevin then drove me home because neither my car at parents house, or my dad’s car were going to get me home. I ended up at home alone with the dogs, without Barb and without my car. My keys were actually found. I didn’t have to make a whole set of new ones or walk home. The time and worry inconvenience was minor. The minor distractions of my work day are not fatal. They are minor distractions. My dad got his antibiotic in time to get working. Barb is with them to make sure their care is being well taken care of. I have a terrific friend who had the means and motivation to help us in our hour of need. I was at home with two dogs I love, a hot bowl of soup, a glass of wine, a brownie for dessert, and watching television. A large part of the county didn’t have power and of me writing this still doesn’t. There are many who own no home and have no food or shelter. I get all of this, even when I’m going through the challenges. It seems to be much easier to understand it clearer after the fact when you are comfortable. I am happy for the constant reminders God seems to throw my way, like the Bataan Death March scene in the documentary, to jolt me back to reality. As we head closer to Thanksgiving, I find myself with much to be thankful for. The majority of it lies with abundance of family, friends, health, and comfort. We all face major and minor challenges during our day, but if we can keep perspective of where we actually COULD be, then we will realize that we are actually quite lucky. If you are reading this on the Internet, I would automatically place you into a similar situation as me. Granted, I don’t know your own personal or professional challenges, but if you are reading a blog post online, my guess is you have more than most of the world. 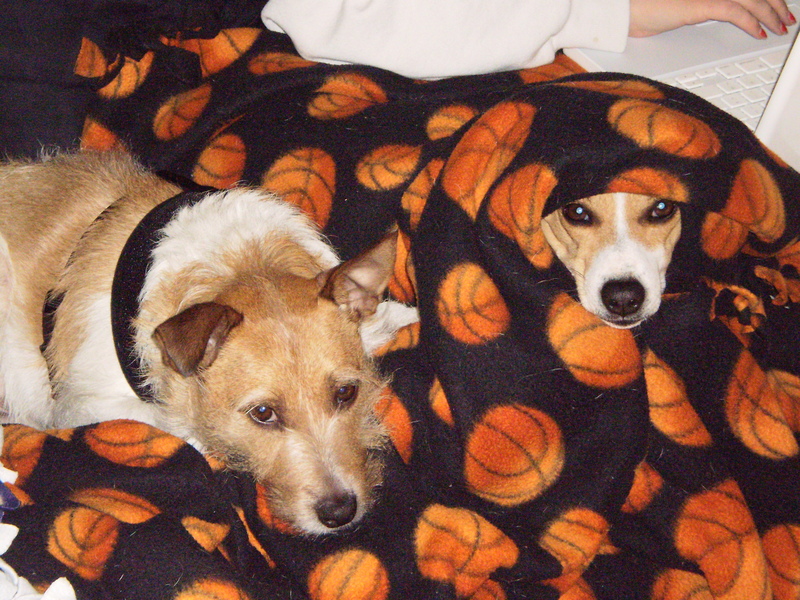 Heck, my dogs live better than most of the world! Here’s to a little perspective…Cheers! Length doesn’t matter. Words do. Lincoln understood the moment, gravity, and passion of the situation. Though the war was far from over, Gettysburg was a turning point as the Union repulsed General Lee’s army for the first time. The carnage of the three days of battle was unfathomable. Lincoln’s task was to inspire a country. When he was finished, he sat down thinking the silence around him implied he was a failure. Rather, it was sheer awe. Lincoln’s legendary speech should be a model for all of us who in business or in life get up to speak. It’s not the length of the speech that matters most. It’s the combination of the right words, at the right time, spoken with great passion that matters most. Read the “Seven score and seven-year anniversary” blog post with images by the Washington Post. 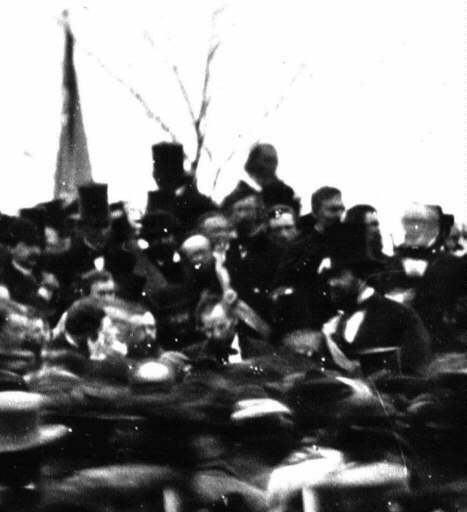 Note – this is the only known photo of Lincoln at Gettysburg. His speech was so short and he got up and down so fast, that the camera man couldn’t get a better photo! Imagine that happening today. Does Social Media Build Strong Relationships? Posted on November 15, 2010 CategoriesBusiness StrategyTagsBusiness, Facebook, social media, TwitterLeave a comment on Does Social Media Build Strong Relationships? I’m certain I will get a lot of people responding with contempt over my short answer, and that’s okay. I ask that you hear me out. I believe social media platforms can be an excellent aid in enhancing relationships. The ability to communicate, share, and provide value is clear. However, I sincerely believe that in order to build that relationship, you must have begun the formation in a more personal manner. Now you might be saying, “Dan, this is just like what pen pals did in the pre-computer age.” Yes, that’s a credible argument. However, pen pals usually were able to scribble more than 140 characters. They were able to write with a broader vocabulary and the anticipation of the next correspondence was part of the fun. 1. Just because you are a friend on Facebook or have someone following you on Twitter, does that mean you’d invite them to your next barbecue? 2. How many of your friends or followers have you met in person or talked to on the phone? That’s usually one of the first clues that you have a strong relationship. 3. Do they trust you enough to pay their hard-earned cash to purchase your product or service? Maybe part of the problem is our definition of “relationship.” When I use the term, I mean that you and the other person know and trust each other to the point of having complete confidence in their affinity for your best interest. I believe many people consider the word “relationship” akin to an acquaintance. Social media platforms are a good way to keep in touch with friends, family, and business associates. It’s a great way to find old high school and college chums. And, it’s a fine way to disseminate your opinions, value, and opportunities. However, it can also create a tremendous amount of noise, vulgarity, and wasted time. Start by building relationships from scratch the old-fashioned way and then work on enhancing them through social media. Building strong personal and professional relationships takes time. Don’t be in such a rush to amass great numbers, rather focus on quality. I’m sitting at home tonight trying to come up with a witty, yet valuable blog post and Captain Jack begins chasing his tail. I’ve always wondered why dogs so aggressively chase their tails. I have noticed that in the four dogs I’ve owned, the two male dogs chased their tales significantly more often than the females. There may be a lesson there, but I digress. Maybe they are bored. Maybe they think they are entertaining me. Most probably, they have no reason or rationale. They just do it. 2 – Searching for perfection while letting simply successful pass by. 3 – Knocking on the same doors and deep down knowing these doors will never buy from you. 4 – Avoiding doing the work you know you must do by finding something less productive to steal your time. 5 – Having a “victim mentality” by blaming others for your bad luck. The reality is that you make your own luck, and you will never do it by chasing your tail. Dogs do it because they believe this is fruitful behavior. It just might be for them. For you, it will lead to lost opportunities, wasted time, and frustration. Be able to recognize when you start chasing your own tail, learn how to fix it, and focus in on the dog treat at the end of your day instead! Veterans Day is a day that often seems to get overlooked by “bigger” holidays, like the 4th of July. However, having grown up and now living in a military community, Veterans Day has special meaning. 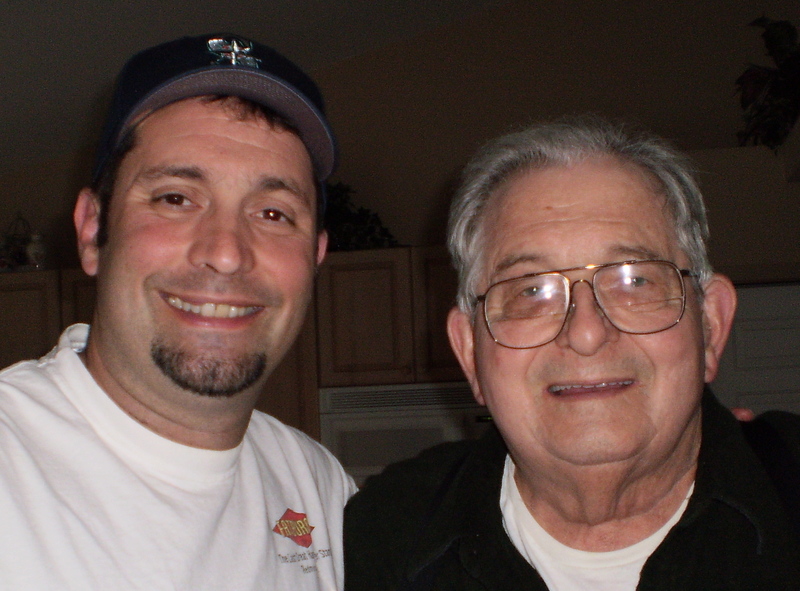 And for me, Veterans Day will always be emblematic of my father. Dad was 16 years old when the Japanese bombed Pearl Harbor on December 7, 1941. He lived in Bremerton, WA where the Puget Sound Naval Shipyard is based. To him, there was no doubt what his future held. On February 11, 1942, the day after his 17th birthday Dad enlisted in the Navy, following in the footsteps of his older brother, Max. Dad wanted to go on his birthday, but my grandmother demanded that he spend the special day with the family. She was frightened that she would never see her sons again. Fortunately for us (me in particular), she did! Dad was part of what Tom Brokaw coined, “The Greatest Generation.” There was never any doubt about duty to country. Ironic as I am currently reading James Bradley’s book, “Flyboys” about WWII pilots, and as I read about them and their values, they remind me about Dad. Men and women like Dad, who put country first, duty first, and themselves in harm’s way first is what we celebrate today. Dad never finished high school at Bremerton High. He should have been in the class of 1943. Thanks to a special program by states and the United States government, veterans like Dad have been given the opportunity to graduate from either their original high school or the one near where they live. Ironically, Dad lives near Bremerton again, however he had a dream of graduating with one of his grandchildren. 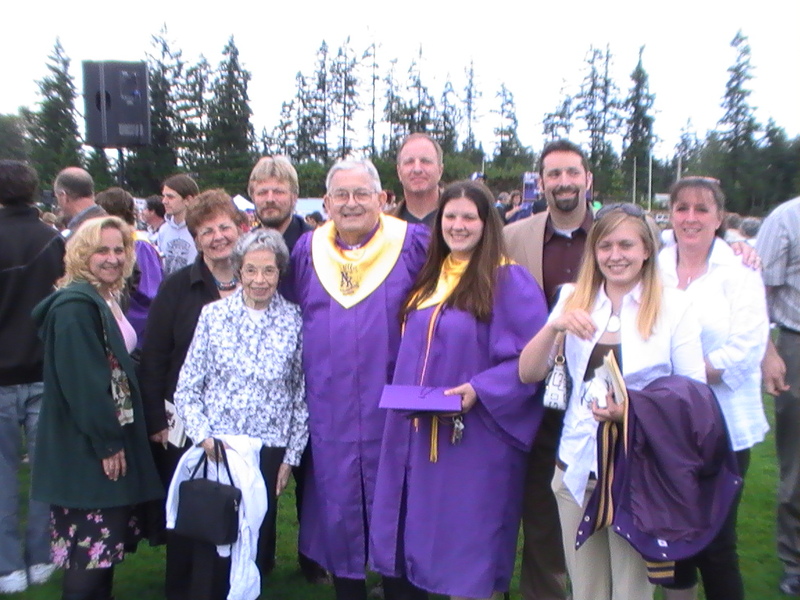 In 2007, 67 years after his original graduation date, Dad attended commencement ceremonies at North Kitsap High School in Poulsbo along with his granddaughter (my oldest daughter) Mindy. It was one of the proudest moments of his life. We all felt the same way. Veterans Day is to honor our great veterans who have served this country over the past 244 years. Today, Dad is 85 years old and is the poster child for this day. I’m proud to have him as my father, my kid’s grandfather, a hero for this country, and my hero. I recently made a format change on my monthly newsletter, Weedin 360. I’m making a concerted effort to bring into unity all the areas of expertise I have to better help my clients. I’ve discovered that what my talent, strength, and passion revolves around is creating, building, and enhancing relationships. Let’s face it, both professionally and personally, relationships will guide us to either success or failure. Good relationships promote the former, while poor relationships guarantee the latter. I’m concerned that it’s not only the youth who are losing their ability to build relationships due to technology. I’ve noticed a growing number of adults who use text and e-mail to carry out what should be relationship-building processes. I love using text messaging for what it’s intended for – delivering information. For instance, I just now had a conversation over text with my massage therapist to change the time of our appointment tonight due to a conflict. Three texts got the job done and saved both of us time. However, I know there are people out there who carry on extended and deep conversations using only text or e-mail. Why? Because they don’t handle conflict well and it’s much “easier” to deal with it one-dimensionally rather than in person. Unfortunately, the consequences range from miscommunications to shattered relationships to the inability to hold meaningful conversations with humans when they most need to. It’s a severe lack of self-confidence. If you don’t think this is a problem, watch your kids (or somebody else’s kids) texting habits. I’ve seen people text each other when they were in the same room! How about watching adults text incessantly at meetings? I’ve seen adults rudely holding texting conversations in the middle of a presentation. It’s on the verge of being out of control. Use technology to enhance your relationships, not hinder them. Use text to let someone know you are running late, not that you want to break up. Use Skype to meet online face to face, rather than sending an impersonal message. No matter where technology tales us, business is still built on relationships, and often needs more than 140 characters! To read my last newsletter that I mentioned at the beginning of this article, click here.